However much we cut back, at some point we do have to buy stuff. The hairy northerner and I cut our costs drastically when he was made redundant, really only buying the most basic stuff we HAD to buy. But now he has a short term contract, we’ve started to buy things again. Obviously, over the months the list of what we NEEDED and would really LIKE to have, had grown a bit. 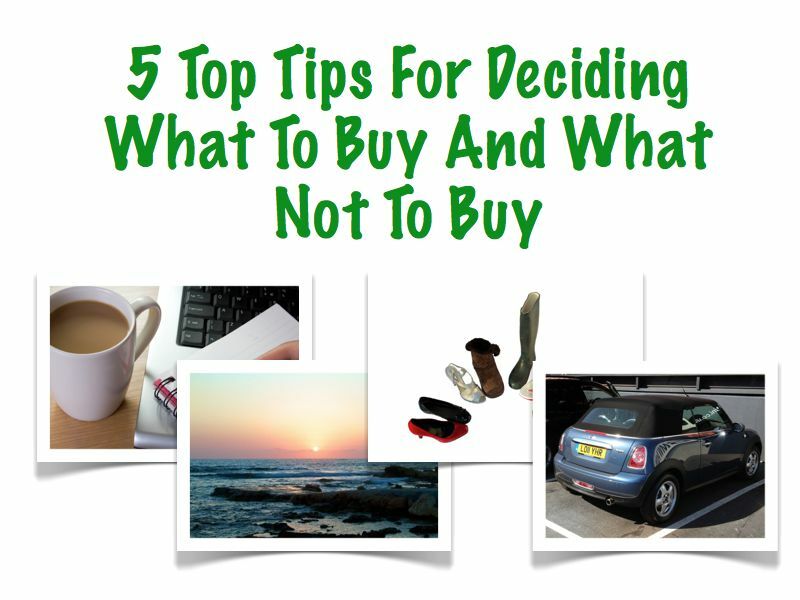 So how on earth to work out what to buy, what to buy later, and what not to buy? 2) How many days do you need to work to pay for it? 4) What else could you have instead? 5) Does it mean going into debt? 1) It’s only little – but how much do little buys add up to? It’s only a little cost right? A coffee, a magazine, a nail varnish, a kindle book, an iPhone app, or one of those little £1 toys for the kids. The question is though, how often do you buy it? One of our biggest savings has been the removal of coffee and lunch from the big hairy northerner’s spends. Whilst I was thinking about this, I was asked to take a look at My Family Club and review their website. So I was really pleased to find that there was a handy little calculator which will help you with this (and probably give you a minor heart attack when you see the truth of these spends) and show you how much these things probably cost you per month or year. What I really liked about it was that there was then a link to ‘Savvy Suggestions’, with lots of ideas that you might not have thought of when in the midst of a financial panic about what you could possibly cut out. 2) It’s a bit more – but how many days do you have to work for it? If you are looking to buy something more expensive like a holiday, car or gadget, it’s worth thinking how many days it took you to work to pay for it in order to see if it’s really worth it for you.? (I know you might not be working, but don’t take this as a guilty thing that hubby might have to work to pay for it – after all we all deserve payment and you are doing a great job looking after the kids). You need to work out how much you take home after tax. You could take your payslip and multiply it by 12 for this. Or take your salary and multiply it by .2 if you are in the 20% tax band, .4 for 40% and .5 for 50% to get how much tax you pay and then subtract it from your salary. You may actually take home less than this due to pension payments and National Insurance, but it will give you an estimate. Take off 8 bank holidays = 252. Take off your holidays – lets say you get 20, so you work for 232 days per year. So an iPad is nearly a whole weeks worth, an outfit is probably a days worth, the average family holiday could be a whole months worth or more. Remember that you have other things that have to be paid each month too. 3) It’s going to save you money? Recently we have changed both our cars. The change of mine to a Mini One convertible will actually save us money within 6 months. The hairy northerner has changed his Honda civic to a Renault estate car, which will save us money within a couple of years. But most importantly with him now contracting, we have protected ourselves from sudden big bills. Plus we now have a car that we can try out our new money saving and adventurous idea of going camping. But when we went looking for a tumble dryer we were more conservative. A more efficient energy rating machine of type A would have paid for itself over 4 yrs. BUT most warranties only last 5yrs, so we could have been buying another one by then. Instead we went for one that was a type B, but with a great decibel rating that is ok in our kitchen. 4) What else could you get for the money? So many times we realise after we’ve bought something that we would have preferred something else, or we are now in trouble because there is something else that we have to buy. So I recommend a glass of wine and sitting down one evening thinking of lots of things that you would love to do or things you would love to have. After a while you can have a list, so that when a new idea comes up, you can compare it to the list and make sure you aren’t buying the wrong thing. One of my best mates has just been told off by her bank for spending so much on holidays. But her family love holidays, so it makes total sense to me that they keep going. However, I did suggest that maybe whilst they also have a lot to do on their house, they don’t add extra expenses like private education. It’s about knowing you, what you love and not feeling pressured into buying things that wouldn’t currently give you the value for money. 5) It’s going to require some debt? Our rules are tough on this, apart from a house, I don’t want to be in debt for more than a season. A season? Yep. Because, so many people I know, end up paying for something for 6-12 months or more, but don’t get that much value from it. Hardly anything is worth being in debt for more than 3 months for. So that’s my rule; if it’s going to take more than 3 months to pay for, it’s probably not worth it. What do you reckon to my tips? Do you already do something like them, I’d love to know? Or do you prefer to just buy and panic later! Don’t forget I have written a pile of tips on saving money and cutting costs which you can check out. I recommend you check out My family club, not just because they paid for this post and review, but also because I think it’s a great site. It has tonnes of information explaining lots of financial things that you probably think are really scary; like savings, pensions and mortgages and loads of tips. The website has a really lovely feel to it. It’s not overwhelming or dry, and it feels very friendly and helpful. Best of all was that it really wasn’t difficult for me to find loads of things that I liked and could recommend about them (phew – because I now have some money to use points 1-5 on and decide what to buy!). MOST importantly they have a competition where you would win an IPAD3 when you register!!!! What a great post – I used to justify my spends by using the silly ‘fashion-y’ cost-per-wear explanation which in all honesty doesn’t really work (for me at least). Though I still like my fashion, I’m now queen of the budget and try and buy, within.my.means…. A place that used to be a foreign country but I’m getting more and more acquired with it every day! Brilliant post, Lisa. I love your #2 tip especially as it helps to work out the worth of something. Having older children, as I do, this is a great way to show them how I would have to budget for a new item in the house. It helps them to appreciate it more too. Thanks Nickie. It can be a shock can’t it when you realise how many days it takes to pay for the basics a month and how much something you take for granted will take to pay for. I drew Max a picture of a triangle and explained where all the money gets spent – just basic stuff like that can be an eye opener sometimes for little ones bless him! Thanks Ruth, sorry it took me so long to reply! Thank you so much lovely, I’m really pleased you enjoyed it! I love the roundups, as I got really overloaded by RSS, so they are the perfect way to find interesting things to read.